Pope Francis has called for the Year of Mercy, and at Dynamic Catholic we have spent the last several months reflecting on how we can serve you and your parishes in a powerful way to discover and experience the Year of Mercy. I will tell you what we came up with in a moment. But first, something personal. This quest deep into the meaning and experience of mercy has made me realize something about myself that I have always known at different levels, but always need reminding of. The Year of Mercy is a powerful invitation to serve others. I hope together we can all respond to that invitation. To help you and your parish have a powerful experience during this Year of Mercy, we came up with two initiatives. 1. Best Advent Ever™. Just like our Lenten program, this will be made up of daily emails that will feature myself and six other leading Catholic voices. Sign up here today! 2. Beautiful Mercy. 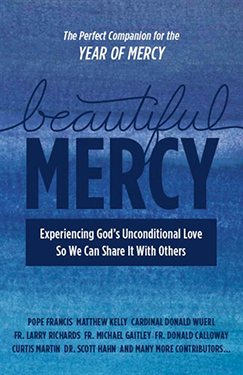 This is a book written by more than twenty leading Catholic authors to help you explore the theme of mercy. Order your copy today! This week I am excited to be on a pilgrimage to Italy with a group of Dynamic Catholic Ambassadors. We are offering Mass and praying for you and your families during the trip. Please pray for Dynamic Catholic and the work we are doing here. There is only one type of person God has used powerfully throughout history: He does incredible things with the people who make themselves available to him; it is the prerequisite for mission. Adam struggles to get out of bed each morning. It isn't until he completes his daily stretches that his right leg will loosen up enough for him to walk. He is just twenty-six years old, but his leg functions like that of a man much older. It's been two years to the day since Adam was honorably discharged from the Marines. Injured in a firefight, he will always walk with a limp. He smiles, though, as he thinks about the day ahead. His parents are throwing a party to commemorate his return home. His whole family will be there. He finishes his stretches and rests in a chair by the window. He pauses, takes a deep breath, and begins to pray. He thanks God for his wife and asks him to guide her in her day. He prays for his family and friends, each by name. He prays for all the men and women still in active duty. He prays for the conversion of his enemies. Finally he offers the pain he will feel in his leg for all the men and women he fought alongside who do not get to celebrate a return home the way he does. He prays for their souls, that they may rest eternally in the peace of God. Adam winces as he rises and grabs for the cane by the bed. He joins his wife for breakfast and they begin the day together. Every morning David wakes up at six thirty. Every morning, that is, except Friday. On Fridays he gets up at four o'clock. He shaves, showers, and dresses for work. At five o'clock he kisses his wife and checks on his kids before leaving for the day. As he looks at them sleeping in their beds, he smiles and says a quick prayer thanking God for his family. On Fridays David serves the breadline in the city where he works. He puts on a smock, gloves, and a hairnet to serve those who do not have the means to provide for themselves. On any given Friday David can be seen serving the homeless, the working poor, addicts, and the mentally ill. Some say thank you, others thank God for him, and still others don't say a word, often returning his smile with a scowl. Every Friday he looks forward to seeing the regulars, Jeff and Alex. After serving food for close to an hour, David is able to sit with them and share a cup of coffee. The trio shares stories about their kids and favorite athletes growing up. All three enjoy the company far more than the coffee. David isn't a morning person and doesn't enjoy the four a.m. wake-up call. He struggles to choke down the stale coffee and if he had a choice, he would never wear a hairnet. But every Friday, as sure as the sun will rise, he can be found serving the breadline. Catherine and Howard have worked hard for everything they own in life; money doesn't come easily. They've done their best to raise their four children. They've sacrificed family vacations and dreams of a second car for baseball gloves, ice skates, books for school, etc. The most challenging times came when Howard was periodically laid off from his job. He never hesitated to take whatever job was available so that his kids wouldn't have to suffer. In fact, they'll never know that there was a time when he worked as a garbage collector to ensure food was on the table. Catherine makes curtains and sews clothing. Howard fixes cars and has mastered the house's plumbing system. They've counted pennies and made ends meet, never asking for anything in return. One day, their youngest daughter, Samantha, comes home from school with news. The night prior, her best friend, Tanya, was thrown out of her house. Tanya's mother chose her new boyfriend over her daughter. Tanya is eighteen, alone, and on the streets, without a penny to her name. Without hesitation, Catherine and Howard welcome Tanya into their home. They open their doors for her, will provide for her, and will find a way to make it work for their family. Mary Anne fell ill with pneumonia at the age of eighty-seven. She survived but the recovery has left her bedridden. She is weak, no longer able to carry out the daily demands of feeding, washing, and dressing herself. She has gone from being an incredibly active and self-sufficient woman to depending completely on those around her. Mary Anne has struggled with this transition in her life. Her self-worth was wrapped up in her ability to give. "What's the purpose of living life stuck in a bed?" she would ask God. For the first time in her life, she has grappled with despair. Nearly every day, despite an hour-long commute each way, Mary Anne’s daughter bursts in the door with a huge smile and a story to tell. Danielle has her mother’s energy and joy for life. Mary Anne’s despair has met its match in Danielle. Together they laugh and talk through the hard reality of Mary Anne’s new life. Danielle helps keep some semblance of normalcy for her mother by dyeing her hair to cover the gray and painting her nails so she has something pretty to look at when the nights get lonely. Serving others is at the core of the mission God has for his children. When it comes to serving people in need, our family, the Catholic Church, has an incredible track record. The Church feeds more people, houses more people, clothes more people, educates more people, and takes care of more sick people than any other institution in the world. And the Church achieves this through the action of ordinary Catholics like you and me. For thousands of years God has been using ordinary people to do extraordinary things. He delights in dynamic collaboration with humanity. He doesn’t necessarily choose the people who are the best educated or who are good-looking; he doesn’t choose people because they are in positions of power and authority; he doesn’t always choose the most eloquent and persuasive. There is only one type of person God has used powerfully throughout history: He does incredible things with the people who make themselves available to him; it is the prerequisite for mission. Before I became a father, I thought I knew something about the love God the Father has for me. Then my son Walter was born. I found myself constantly yearning to be with him. He couldn’t walk or talk. All he did was eat, and sleep, and need his diaper changed. But I loved being with him. Over the years, that hasn’t changed. As my wife and I have had more children, I yearn to be with each of them in the same way. I love my children so much it’s crazy, really. And before I had them I just didn’t understand. But as I began to think about this great love I have for my children, the love of God took on a whole new meaning. Because if I can love my children as much as I do, and I am broken and wounded and flawed and limited, imagine how much God loves us. This thought was overwhelming to me and took my relationship with God to the next level. The same goes for God’s mercy. We may think we know that he loves us or that his mercy is boundless, but have we experienced it? Have we been the hands and feet of God, the living embodiment of his mercy to those around us? It’s simple, but imagine how the world would be different if everyone practiced just one work of mercy each day. How would the world be different if these works of mercy defined the way we live our lives? There is genius in Catholicism, but sadly it is little known and practiced. At Dynamic Catholic we are committed to giving you simple and practical ways to live out the genius of Catholicism and become the-best-version-of-yourself®. For this book, we’ve enlisted the help of some incredible authors in the Church. These authors have taken the fourteen works of spiritual and corporal mercy and provided simple, practical ways for you to understand them better and to incorporate them into your everyday life. I hope you pray through this book and invite the mercy of God to transform your life, because in the end it’s all about God’s mercy. Sometimes the best way to think about life is to reflect upon death. When I think about my life and how I have offended God, all the opportunities I have had to love that I have turned my back on, how little I have done with the gifts he has given me, I hope he is merciful. When I reflect upon all my faults and failings, my mistakes and sins, my pride and arrogance, I hope he is merciful. In the end we each must fall at the feet of God and beg for mercy. In the end it all comes down to mercy. Let us now strive to show others the mercy we hope to receive. Family disagreements can often be uncomfortable. We avoid them rather studiously. When we do have to face issues, discussions can become volatile. Family discord, then, seems only to harm. But I turn to the words of Pope Saint John XXIII at the opening of the Second Vatican Council on October 11, 1962. Prayer: Always pray. Use the Prayer Process and talk to Jesus. Talk to God the Father and ask the Father how he sees the situation or the other person. And pray for the other person, too! Empathy: See if you can satisfactorily articulate the argument of the other person. Ask the person to give you at least three tries. Sometimes we argue on different wavelengths. No wonder we get heated! Faithfulness: A doctor was burned out from his practice and decided to take a sabbatical with Mother Theresa to decide what he should do next with his life. She put him in a hospital with terminal patients. One day, as Mother was making her rounds, the doctor asked Mother to pray for him that he may have clarity in his decision. Mother Theresa immediately said, “NO!” and quickly walked away. The doctor was surprised at her abruptness. However, three months later she was in his area again. He approached her, asked if she remembered him. She replied she did. He asked politely why she was so quick to say she would not pray for his vocational clarity. Mother Theresa said that it was because we are Christians and Christians do not live with clarity. We live by faithfulness. Whether a family discussion or just two of you, prayer, empathy and faithfulness will guide you one step closer to God. 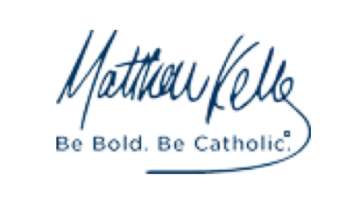 This is my conversion story, which would not have happened without Matthew Kelly, Dynamic Catholic, and the work they are doing. God became a non-factor in my life in my early high school days—and little changed as an adult. However, in 2001, I found myself drawn back to the Church. I started attending Mass on Sundays, searching for a little peace in my otherwise stress-filled life. That fall my wife, Kristy, had the idea that we should both join the choir at our parish. Even though I had been searching for something in my life, I was having none of church choirs or choir singing. “I’m a musician, not a singer!” I intoned, over and over. Although I still don’t know how it happened, one afternoon I found myself in a chair in a rehearsal room trying to sing Vivaldi’s “Gloria” in Latin—and not doing very well. Somehow I persevered with choir until Christmas, ended up falling in love with classical choral music and the 500 years of musical repertoire in the Church that we were blessed to be able to sing, and started to experience a spiritual awakening as part of our offering of musical prayer to God. For the next twelve years until early 2013, I sang dutifully in the choir loft every Sunday, got involved with the choir leadership committee, and attended parish functions from time to time. 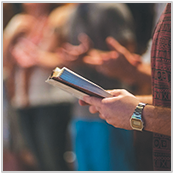 Although I was at Mass each Sunday, I was not really engaged in the Mass and didn’t pray or think about God or religion during the six-day gaps between Sunday Masses. But through late 2012 into 2013, something was at work inside of me because I was searching for something more in life. At that time, I reconnected with an old friend, who invited me to attend an event with Matthew Kelly. Although I had never heard of Matthew Kelly, I decided to accept the invitation. I was intrigued by Matthew’s talk that night on Catholicism. 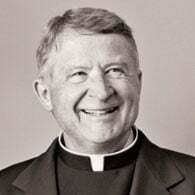 Everything he said seemed to make sense, and most of it—nay, all of it—although I had been attending Mass each Sunday for twelve years, was news to my ears. There were stacks of his book, The Four Signs of a Dynamic Catholic, and I was surprised that they were being given out for free. I gladly took one and was anxious to start to read it the next day. My Catholic formation had been non-existent since early elementary school, and yet, I thought that I was a pretty good Catholic—I attended Mass every Sunday, sang in the choir, was active in a leadership position in the music ministry, gave in the collection basket, and attended some other parish events. What else was there? I dove into The Four Signs book and was instantly hooked. I wanted to know who were the “dynamic Catholics,” and what did they do? Ten minutes of prayer each day? I did not pray back then, but I could manage 10 minutes a day. Study? I’d been a reader all my life, and I could certainly read and study great Catholic literature. I had never read the Bible, but I found an old copy of a children’s Bible from one of our kids and started to read a little. I knew I could probably increase my generosity somehow, but evangelization threw me a little—Catholics did that? I finished the book and had to have more, so I ordered a Rediscover Catholicism audiobook from Dynamic Catholic and went through that during my 45-minute commute and whenever I was in the car. I had basically decided to become a “dynamic Catholic” and dove into the deep end not knowing that my life would never be the same. By late May I was stopping by a Catholic church for 10-15 minutes of prayer each morning on the way to work, was listening to Catholic audio books and Dynamic Catholic CDs in the car and reading the Bible at home, and had asked Sister Margaret—who sang with us in our choir—to help me know more about this Catholicism that I was just starting to discover and, despite being a cradle Catholic, had never really known. I couldn’t get enough and was in the midst of a profound conversion and immersion in our Catholic faith! By June I was so hooked on Catholicism that I approached our pastor about the Dynamic Catholic Book Program. Our pastor asked me to get more information on the Book Program, and although the path to implementation at our parish was not straight or quick (I had a lot to learn about things happening in “God’s time”), at our Easter Masses in 2014, we gave out 3,000 copies of Rediscover Catholicism in English and Spanish. In the meantime I had taken a 10-week course on the “Spiritual Exercises” of St. Ignatius, was deepening my daily prayer life, and had immersed myself as much as possible in Catholicism and Jesus Christ. I had never had a personal relationship with God, but a year after hearing Matthew Kelly and picking up The Four Signs of a Dynamic Catholic, I knew that Jesus Christ was becoming my best friend. I am indebted to my friend and to Matthew for the spark that has become a flame in my life for Christ. I am now in his service for the rest of my life and beyond, and am dedicated to spreading his Good News and living Catholicism to the fullest. 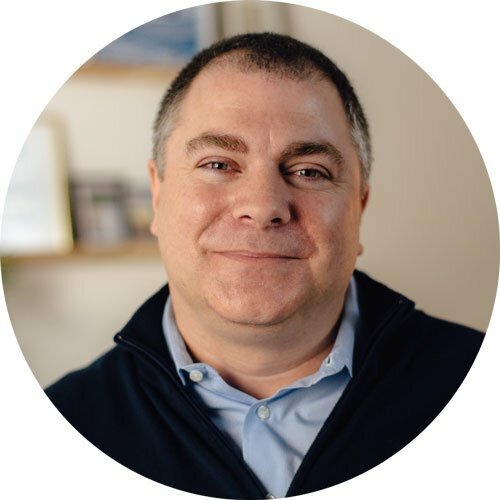 Thank you, Matthew Kelly, from the bottom of my heart and soul for what you do and for your amazing team at Dynamic Catholic. Please keep it up. I will pray for you and your staff.